This baluster vase has excellent, clear provenance that dates to the 1940s, when it was acquired by an English family in Malacca. 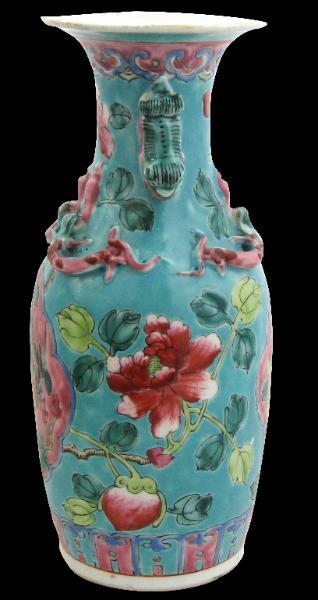 The vase is brightly enamelled with shaped panels containing a single phoenix in flight over sprays of peony blooms, buds and foliage against a pink background, surrounded by a turquoise-ground decorated with further peony blooms and foliage. 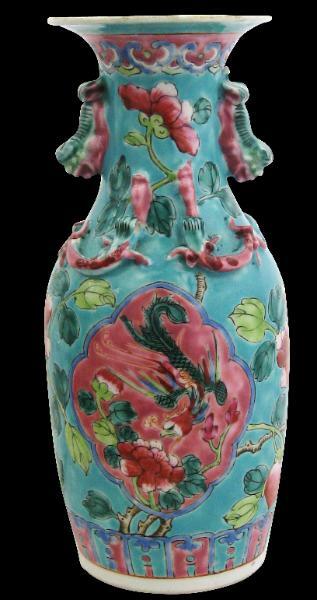 The neck and shoulder have moulded felines with green and pink bodies and dragons in green and pink with red spots. The lower part of the base has a border of brightly coloured green and pink lappets. A pink scalloped border is below the rim, which is edged with gilt. 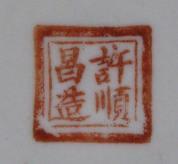 Xushunchang Zao factory mark in red enamel. Vases were not used in the Straits Chinese house to decorate rooms with bunches of cut flowers. Instead, pairs of baluster vases such as the example here were used on the family altar to hold flowers – usually freshly-cut chrysanthemums – meant as offerings to the gods and the spirits of the departed. They were placed on the altar with other religious objects.